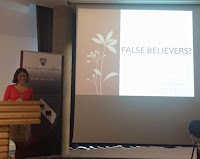 On 22nd and 23rd June, I, together with Helen Bradley and Suki Finn, organised a Mentoring and Networking Workshop for graduate and early career women in philosophy, which took place at the University of York. The aim of the workshop was to bring together women in philosophy from a various areas of philosophy in order to offer support and encouragement, and to develop a community of women in philosophy. The workshop had eight graduate or early career mentees, and seven senior women in philosophy who acted as mentors. 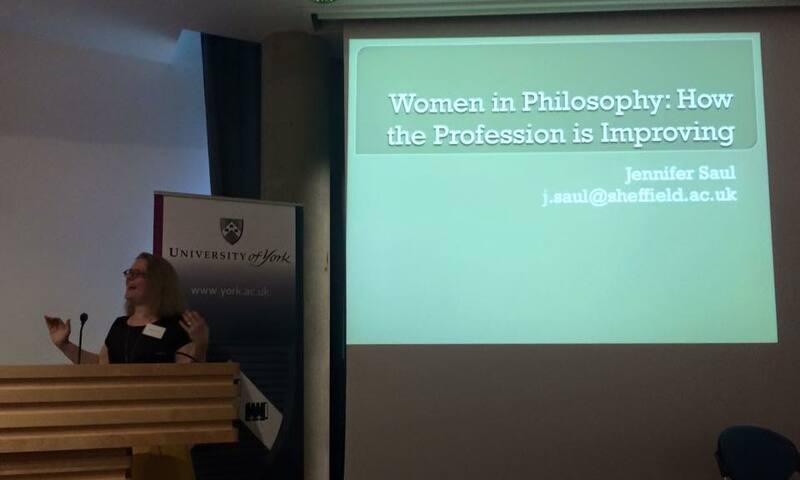 Jennifer Saul (Sheffield), pictured above, opened the workshop with her talk 'Women in Philosophy: How the Profession is Improving'. Jennifer talked about the low number of women in philosophy, and the factors which might be responsible. She also talked about how things have improved for women in the profession, and what can be done to further improve them. 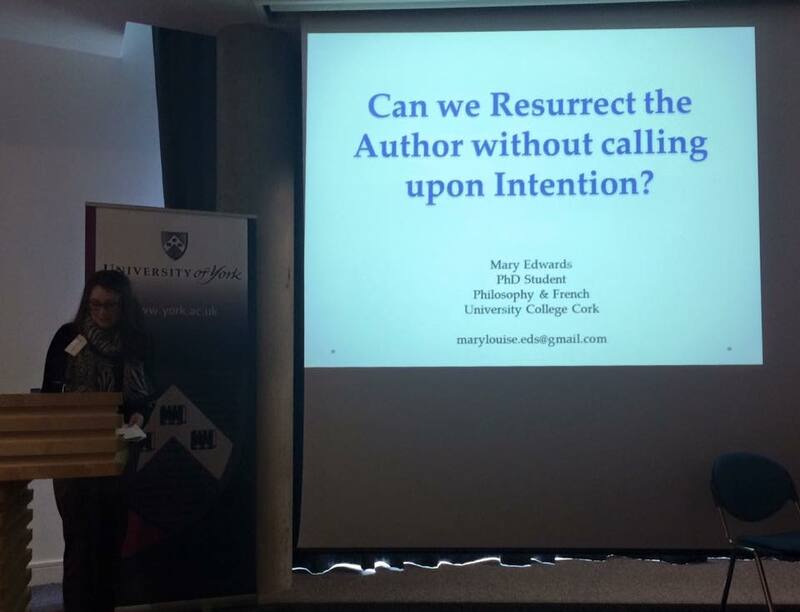 Mary Edwards (Cork), pictured above, was the first mentee to present her paper, 'Can We Resurrect the Author without Calling upon Intention?'. Mary offered a new argument for the relevance of the author of a work which circumnavigated the dispute about intentions in the literature. Her claim was that the author's expressed attitude toward the world she describes contributes to the reader's experience of that world. 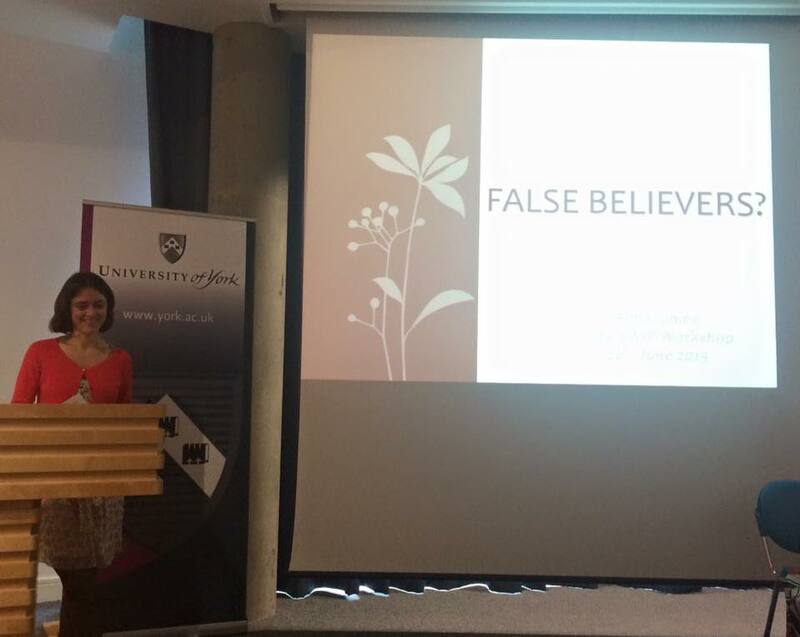 Next up was mentee Anna Ichino (Milan/Nottingham), pictured above, with her paper 'False Believers?'. Anna considered the doxastic status of religious cognitions and argued that in many cases, such cognitions are not actually beliefs, and further, nor do we take them to be beliefs. Instead, the attitudes of most religious (so-called) believers, are better described as imaginings. 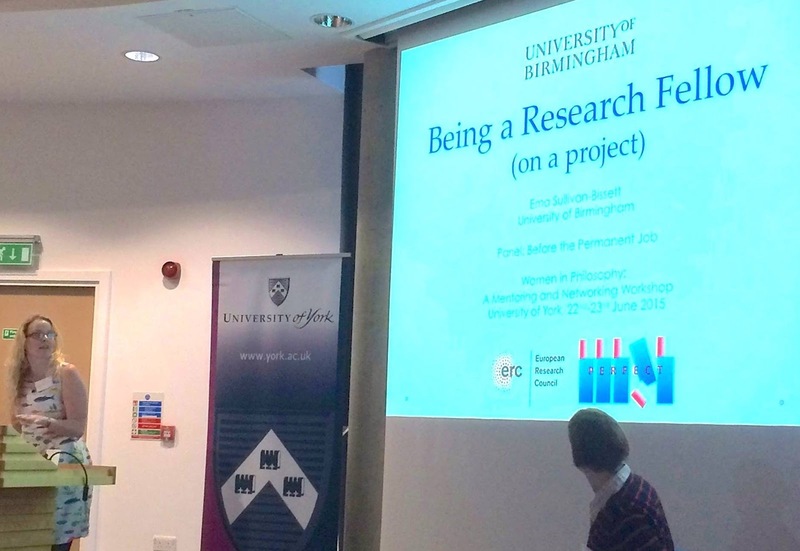 The next talk was given by mentee Chris Meyns (UCL), pictured below. Chris discussed L. A. Paul's argument that we cannot rationally make decisions about some major life events, since such events are epistemically transformative. Chris argued that such transformation does not, contra Paul, undermine rational decisions. Rather, we can partition outcomes based on possible future valences, and so determine our preferences, calculate expected utility, and rationally make a decision. 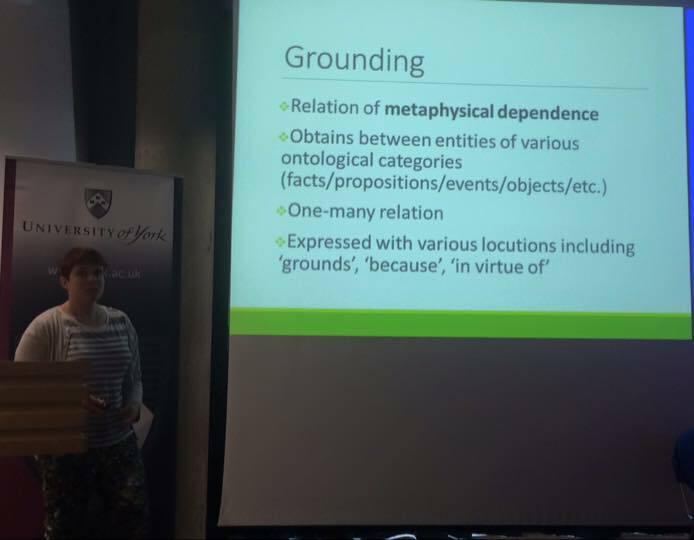 Our final mentee talk of the day came from Naomi Thompson (Hamburg), pictured below, with her paper 'Grounding and Metaphysical Explanation'. Naomi pointed out that elucidation of grounding has often gone via a connection to metaphysical explanation. However, the notion of metaphysical explanation is opaque, and under discussed in the literature. Naomi put forward a dilemma, and suggested that 'the friend of grounding' must either give up the supposed objectivity and mind-independence of grounding, or find an alternative way out of the dilemma. Next we had a panel session called 'Before the Permanent Job' featuring Liz McKinnell (Durham), myself (Birmingham), and Louise Richardson (York), pictured below. 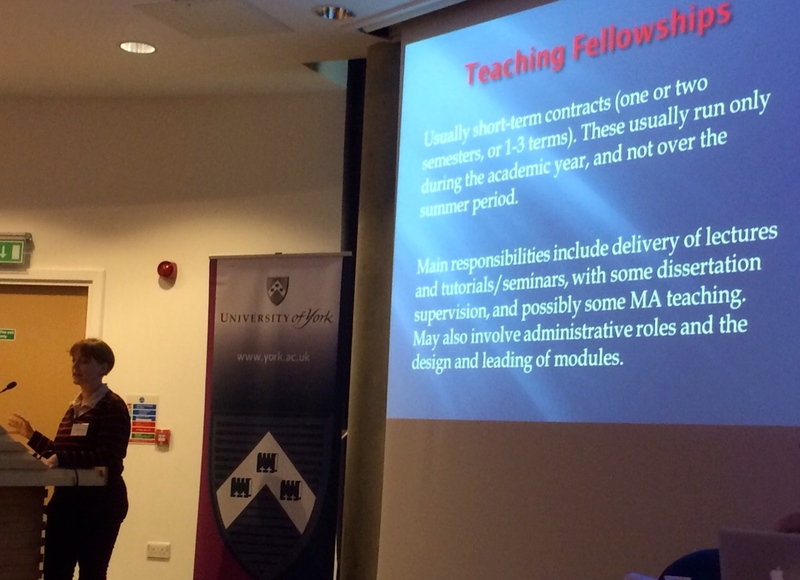 The idea of the panel was to give information and advice about applying for and doing non-permanent jobs in philosophy. 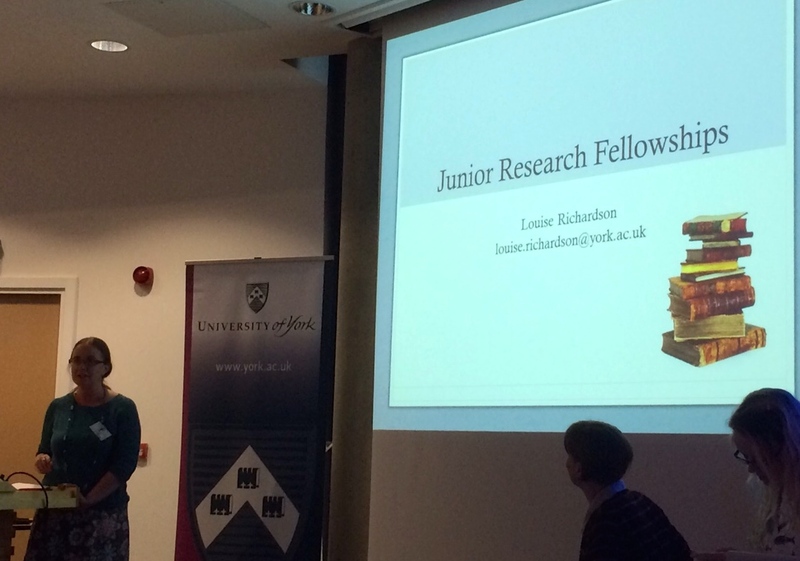 Liz spoke about being a Teaching Fellow, I spoke about being a Research Fellow on project PERFECT, and Louise spoke about being a Junior Research Fellow. Finally, we had parallel mentoring sessions for the mentees who had given their papers on the first day. 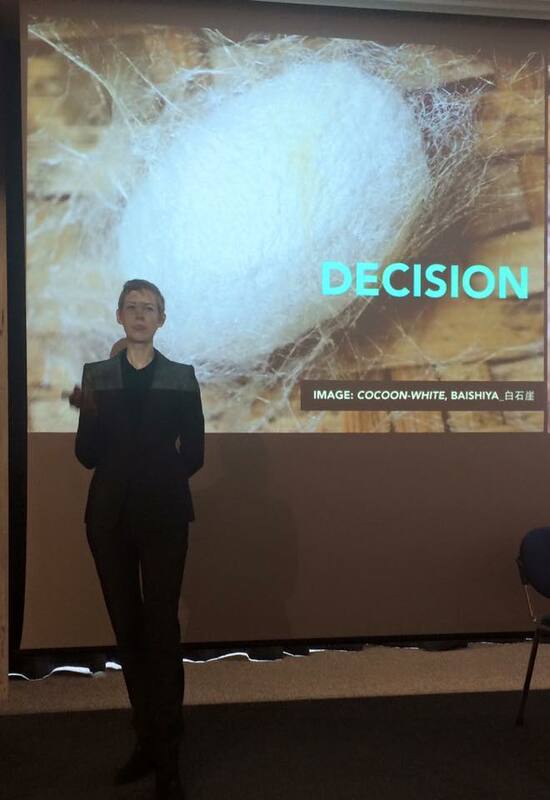 The Aesthetics session discussing Mary's paper was run by mentor Kathleen Stock (Sussex) and sponsored by the British Society of Aesthetics. The Philosophy of Psychology session discussing Anna's paper was run by mentor Hanna Pickard (Birmingham) and sponsored by project PERFECT. The Decision Theory session discussing Chris's paper was run by mentor Laurie Paul (UNC Chapel Hill) and sponsored by the British Society for the Philosophy of Science. And the Metaphysics session discussing Naomi's paper was run by mentor Penelope Mackie (Nottingham) and sponsored by the Mind Association.